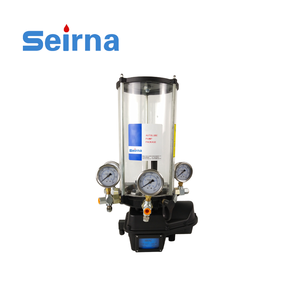 Nanjing Seirna Machinery & Electronic Co., Ltd.
Jiaxing Jianhe Machinery Co., Ltd.
Manufaturer central lubrication pumps and equipment. SL101 Series of DC pumps are 4 different opptions. 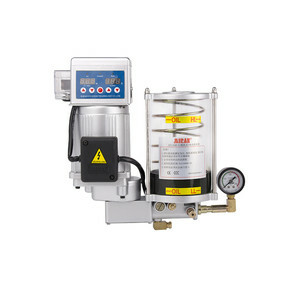 D series are driven via externel timer or PLC EC series are entegrated with digital timer having wide range of on/off setting EC/AL series are integrated digital timer and alarm system via help of proximith swithches located on the divider valves EC/AL3 series are the premium pumps having alarm control system upto 3 primer divider valves. 3,Wear liners and impellers are easily replaced when required by simply removing the front cover plate bolts and sliding off the front cover. 4, Optional external clean water lubrication is available as an option to suit applications where product lubrication is not viable. 5, A range of mechanical seals are available to replace the packed gland shaft seal. 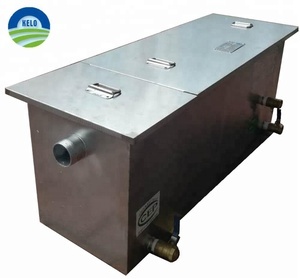 Automatic Lubrication oil Pump SLR/PDI applicable system for option Operation Host Control / an External Special Controller Oil Injection Cycle intermittent; ajustable by a PC contoller Oil Pressure 0~35kgf/cm 2 Oil Flow thin oil 300ml/min; grease oil 50ml/min Working Voltage 220VAC Power 45W Oil Viscosity 32~2000mm 2 /s Tank Capacity 5000ml Oil Pipe Size &Phi;6mm Applicable System Damper Type SLR / Volumetric PDI Automatic oil Pump More Details: the oil injection is controlled by Host or a special controller, with a Liquid Level Alarm, NC / COM / NO outputs, water outlet at the bottom, damper type or volumetric type perferrable, suitable for various lubricating systems. Each piece of oil lubricator in carton box; Below is our packed in-stock products in our ShenZhen warehouse. 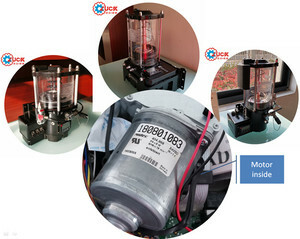 mini excavator for sale Technical Data Output/per element 5.5 ml/min Max system operating pressure 25 MPa Viscosity range NLGI #000 through #2 Outlet thread 1/4 NPT (M12&times;1.5, 1/4 NPTF and Rp1/4 also available) Motor power 50W Motor voltage 24 VDC Reservoir capacity 2 liter, plastic Protection IP56 Interval 4 minutes to 15 hours Running time 8 seconds to 37.5 minutes Current when loaded 3A mini excavator parts mini undercarriage parts The related products Packaging & Shipping . Alibaba.com offers 786 automatic greasing systems products. About 13% of these are pumps, 11% are water treatment, and 1% are construction machinery parts. A wide variety of automatic greasing systems options are available to you, such as piston pump, single-stage pump, and gear pump. You can also choose from electric, hydraulic, and pneumatic. As well as from high pressure, low pressure. And whether automatic greasing systems is oil, air pump, or water. There are 783 automatic greasing systems suppliers, mainly located in Asia. The top supplying countries are China (Mainland), Italy, and Taiwan, which supply 99%, 1%, and 1% of automatic greasing systems respectively. Automatic greasing systems products are most popular in Domestic Market, Southeast Asia, and Africa. You can ensure product safety by selecting from certified suppliers, including 383 with Other, 162 with ISO9001, and 8 with ISO14001 certification.